A liaison, which originally means “to bind, mediate” in French, is an on-site information coordinator for disaster response. 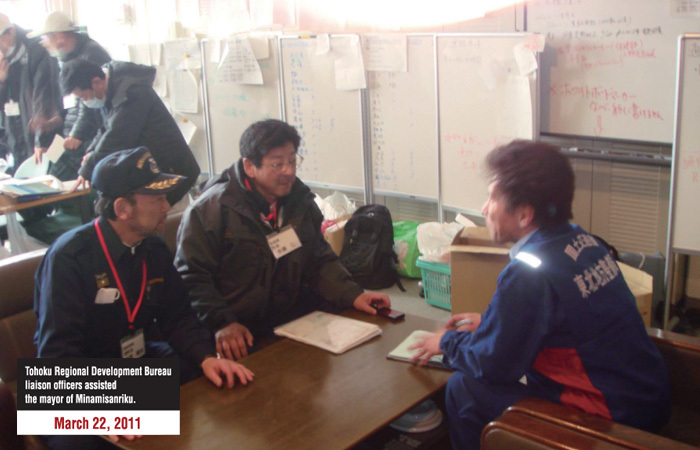 When a disaster strikes, the MLIT Regional Bureau staffs are dispatched to prefectural offices as liaisons for information gathering. 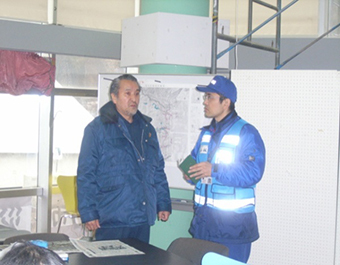 The dispatched liaisons support prefectural and municipal functions. 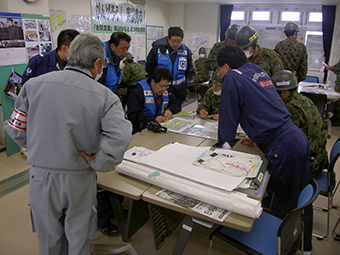 The MLIT staffs were dispatched to the affected prefectures or municipalities, and worked as coordinators in the prefectural or municipal office. They were called liaisons (on-site information coordinator for disaster response). Liaisons coordinated with various support organizations, according to the needs of the municipalities they understood. Liaisons are good at coordination between the prefectural and state organizations, and familiar with the relevant laws. 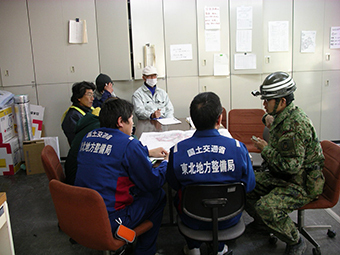 They sometimes worked as local staffs on behalf of the municipal staffs who were completely occupied with disaster responses, and at other times as important and trusted partners of the municipal leaders. The liaisons were sent to 31 municipalities in 4 prefectures. The number of liaisons sent was 96 on March 23 at its peak. Total number of liaisons reached 3,916 by June 30, counted after the occurrence of the disaster. ▲ A liaison reporting to the Mayor of Kamaishi the survey result for securing an electric power source for the Kamaishi Clean Center. 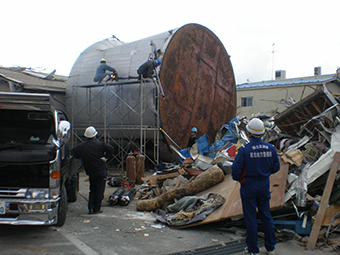 ▲ Liaisons working out a dismantling plan of a giant fuel tank swept away from the port to the affected city area by the tsunami. ▲ A meeting between the JSDF in Higashiimatsushima and liaisons about drainage plan. ▲ A meeting between the JSDF in Shichigahama and liaisons.